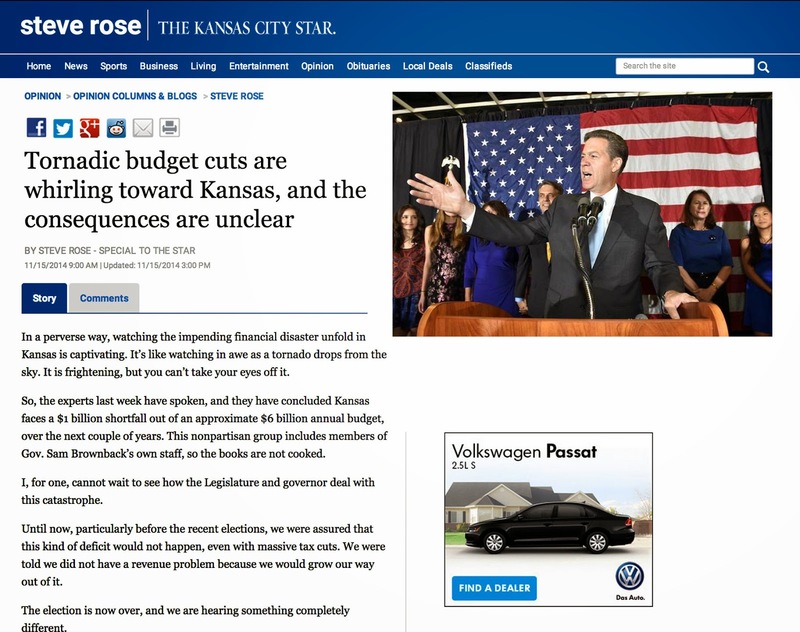 The Kansas Budget: So, What’s On The Kansas Budget Chopping Block? 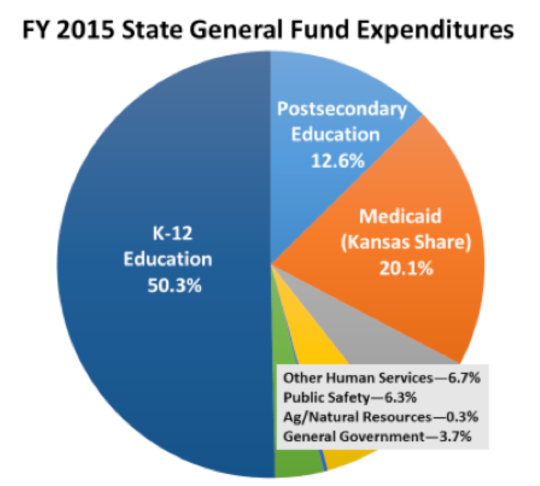 Kansas faces a very immediate budget crisis. At least $279 million of expenses must be removed from the current budget just to keep the state financially solvent. Where will the cuts come from? Is it possible to protect education? The pie chart below shows how State General Fund expenses are currently allocated for fiscal year 2015. A $279 million spending cut is roughly equal to a 4.5 percent across-the-board cut to everything in the chart. But not everything can be cut. Medicaid costs are going up, not down, and the state has little choice but to pay these costs in full. That’s especially true since Kansas has signed contracts with three private managed care companies to provide Medicaid services via KanCare. Without touching Medicaid, a $279 million spending reduction would require about a 5.5 percent cut to everything else. That’s why public education advocates are very concerned. A 5.5 percent cut — implemented after more than half the school year has gone by — would be quite serious. Now consider this: what if K-12th grade education is protected from cuts along with Medicaid? Then, a nearly 15 percent across-the-board cut would be required on the remaining items: higher education, public safety, other human service programs, and general government. And that's just to achieve the $279 million expenditure reduction needed to stay solvent for this fiscal year. Grim, to say the least — particularly with even more tax cuts scheduled for coming years. There’s another option legislators will likely consider: Take money from the Highway Fund. Separate from the state’s general fund, the Highway Fund receives income from fuel taxes, vehicle registration fees, a portion of state sales tax receipts, and the federal government. But no, there isn’t money simply sitting around in the fund that can be easily and painlessly transferred out. The Highway Fund just borrowed $250 million this past summer, and has outstanding debts of about $2 billion from previous borrowings. However, by canceling or delaying projects, and cutting back on highway maintenance, it would be possible for lawmakers to free up money to transfer to the State General Fund. However, unless lawmakers are prepared to make transfers every year into the future, moving money from the Highway Fund is simply a short-term measure that temporarily delays the required general fund cuts. Once lawmakers figure out how to solve the $279 million problem in FY 2015, they get to determine how to cut spending by another $400 million or so, just to stay above water in FY 2016. And what if the Kansas courts rule that school finance is inadequate? What if the recently revised revenue forecast is still too optimistic? Well...then the cuts will have to be even deeper still.